In May of this year the Aberdeen Group published a white paper called, “Creating a Complete Customer View: Best Practices in Master Data Management”. (http://bit.ly/k9qwOT) Master Data Management (MDM) is the quest for a “complete customer view” through data, typically stored in CRM or ERP databases. Of the pressures driving companies to try to see the forest through the data streams, the need to improve customer experience ranks at the top. Almost half of large and mid-sized companies, and 37% of small companies, are motivated by this need. 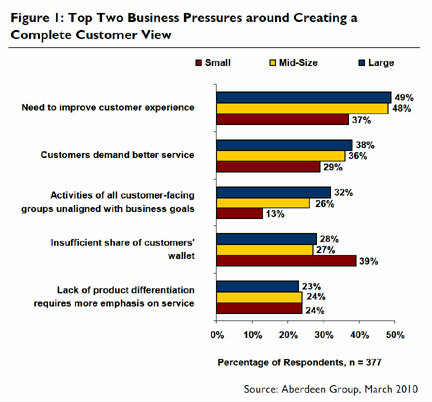 The need to meet customer’s increasing demand for better service is the second place motivator. But capturing “the complete customer view” isn’t as easy as one might think. Incomplete and incorrect records are common – Aberdeen reports that about one-third of data is not accurate, and about one-quarter is not properly classified. Understanding the “the complete customer view” is even more difficult, requiring sophisticated tools and experienced analysts skilled in the art of segmentation. That’s another whole topic. But for those companies who get it right, the payoff for them and for their customers is big. The study shows a 7% increase in customer satisfaction and a 10% increase in retention. Those few points of difference can mean the difference between red and black numbers on the balance sheet. The moral of Aberdeen’s story: it pays to know your customers and work to improve their experiences. This entry was posted in Customer Experience Research, Customer Segmentation and tagged Customer Experience Research, Customer Segmentation. Bookmark the permalink.